Les Deux Alpes resort search and rescue arrives at the scene. PHOTO: Courtesy of BBC News. 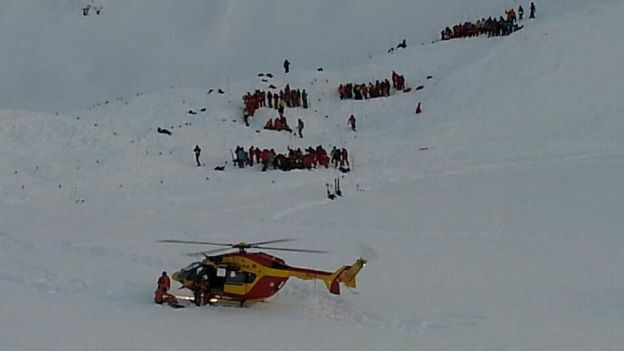 Earlier today, an avalanche in the French Alps killed two high school students and a Ukrainian tourist. The avalanche was triggered on the Bellecombe piste of Les Deux Alpes ski resort near Grenoble, France. A group of ten students from St. Exupery high school in Lyon, France, and their teacher were also buried during the slide. A rescue team of 60 assisted by dogs and helicopters arrived at the scene soon after. According to BBC News, all members of the group have been accounted for by the rescue team. Those suffering injuries have been taken to a hospital in Grenoble.